Discussion in 'GS Boxers' started by Caliboss, Oct 10, 2018. Caliboss Lord of the Marsh. Well, my clutch has gone. Pretty certain I got mineral oil in there and slicked up the disc. Need to get replacement parts. I'm inclined to go with teh kit from BBY. I assume the kit from BBY is legit, but they aren't offering the Siebenrock discs right now. Instead they're offering some discs "from England." Anyone know anything g about those discs? Secondly, BBY stipulates that since my bike was "...built before 4/06 you will need to upgrade to...the updated pushrod and clutch housing cover..."
I had my clutch rebuilt about 5 years ago, how can I tell if they updated these parts then? BBY kits are top notch! Call BBY and ask for a description. Mike is good and can help you figure it out. Rockred, Callisto224, LAFS and 2 others like this. and the housing was 21217697740. According to the fiche that's the number for the correct pushrod, post 04/06. I'm just assuming that the clutch housing number is the one that matches the updated pushrod...?? But I couldn't really make heads or tails of it from the fiche. IIRC the year-05 1200 has the usual hydraulically-operated single-plate dry clutch that plagues most BMW riders by being unreliable and prone to failure due to bad design. A design which was abandoned by the profiteering combine in 2013 when they completely revised the boxer's motor and incorporated a bought-in Chinese wet clutch in order quietly to dodge all the hundreds of complaints from dealers throughout past decades, without going to the expense of a recall to replace inadequate parts. With the greatest respect, may I suggest that you need to hold off from throwing money at the problem and start to investigate and so think ¿ why has the clutch on your bike gone south ? I'll bet it's the failed Clutch Slave Cylinder that operates the pushrod. The little bearing in there rotates at engine speed all the time you're riding the bike. And it eventually dies, seizes up and DOT4 hydraulic fluid as used in brake circuits fills up the cavity that the Slave Cylinder sits in, then migrates along the clutch actuation push rod to splatter your friction plate with a mixture of gearbox oil and DOT4. Goodbye clutch. The solution therefore, apart from splitting the bike in half with its tail up in the air, is to replace the Slave Cylinder, the hydraulic clutch fluid long line to the handlebar and the small, now-compromised oil-seal sitting deep in the gearbox cavity in 'front' of the clave cylinder. And buy the new Italian-made component, not the Magura abomination that BMW still supplies, bought-in from Slovakia at around ten snoojits apiece to them, and sold to you at vast expense. You should stick to what you almost know. The R1200 system, though somewhat similar to the 1150 that you have a little knowledge of, is not the same. It uses mineral oil, and is generally pretty reliable. Your rambling about Chinese (repeatedly) parts, and the rest is just BS surrounded by more BS. Just-show-up-to-GSA, Chuck_V, Jim H and 2 others like this. Each paragraph has so many questions I could ask. Suffice it to say, I don't agree with most of what he says (and I'm no expert!). One of these kits will very likely be what I choose when my own '05 Hexhead eventually needs a new clutch. And I'll bet a beer that the part # listed in post # 3 for the clutch housing cover replaced in '14 matches that of the updated part which BBY refers to in their clutch kit listings. I note for posterity - and because I own a very early Hexhead - that quality parts (alone) for full clutch replacement on these early bikes exceeds $800. I'll guess shop time is probably 5-8 hours, depending on experience, and the typical DIY type will require significantly longer. Well those horses are out, so to speak. Already bought and installed the new slave from BBY, so I'm pretty sure it's not that. And I think I'm to blame for the clutch getting wet anyway. That being said, what are the details on the Italian part you mentioned? I note for posterity - and because I own a very early Hexhead - that quality parts (alone) for full clutch replacement on these bikes exceeds $800. I'll guess shop time is probably 5-8 hours, depending on experience, and the typical DIY type will require significantly longer. Unreliable clutch, what a load of waffle. I’ve done over 400.000 Kilometres on dry clutch BM’s without an issue. I say it’s user error, perhaps you need to step away from your keyboard for a while and do some actual riding. DOT 4 in your clutch system, yep that’s a doozy. 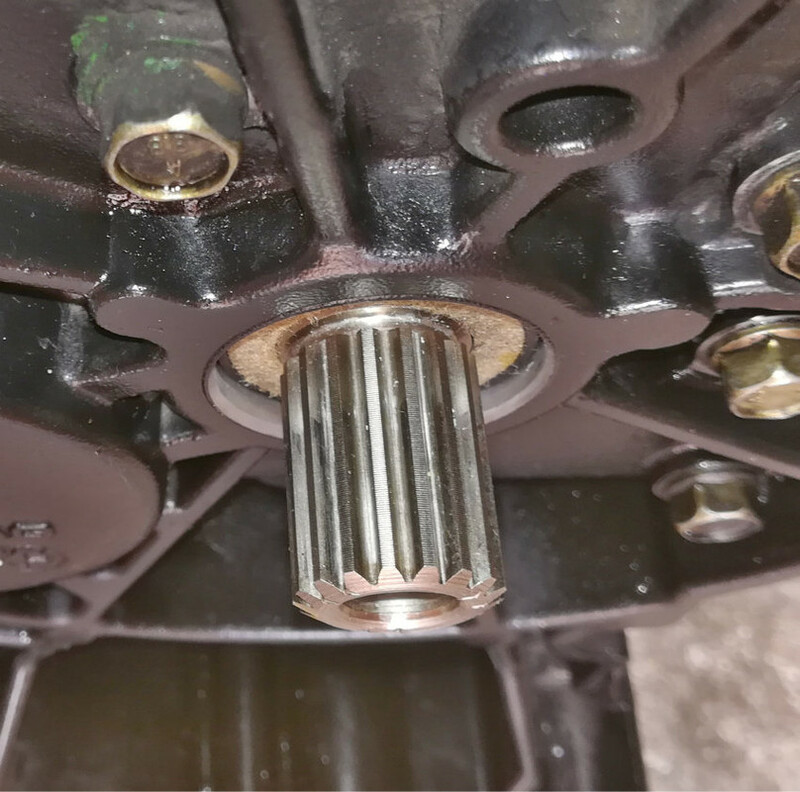 Maybe to support your opinion that the clutch is less troublesome, I was surprised and delighted to see the state of the 14-year-old gearbox input shaft spline and the clutch friction plate hub revealed when I split my 25K miles bike. In fact this interface was indeed slightly moist with a smear of heavy-duty motor grease hen I separated it. So despite all the ringer-bolts coming out dry as a witch's whatsit, plus the bottom-right-hand dowel being rusted into the gearbox casting there, needing several hefty blows with a copper-head mallet on a protective wooden pad to drive it apart, maybe the job had been done by a P.O. earlier in the bike's life. Factory-applied Staburags grease is white. I'm crushed, crushed I tell you! Post truth and facts, I have no issues. Post nonsense and expect to be called on it. This pretty much sums it up another online opinion: "state of the 14-year-old gearbox input shaft spline and the clutch friction plate hub revealed when I split my 25K miles bike". Another office chair expert about something they have little experience about. Hopefully anyone with a R1200gs clutch issue doesn't come across your post and waste time researching your claims. I'm not married to any one brand. I have four completely different brands of motorcycles manufactured in different countries. I'm not bragging just pointing out that I don't just buy German, Japanese, Italian, Chinese, or whatever country of origin or make or model of anything. BMW DOES charge a lot of parts. Don't buy them if you don't like them or they cost too much. And why would someone buy or even waste time fixing something that obviously is a bad design and prone to failure. So..you know nothing of the system..